Hiya guys! My head is spinning this week. I've been swatching so much and therefore getting in a ton of new shows in the process. Though I wouldn't suggest foreign dramas while swatching, looking at the screen for the subtitles is so distracting to the task at hand, haha. 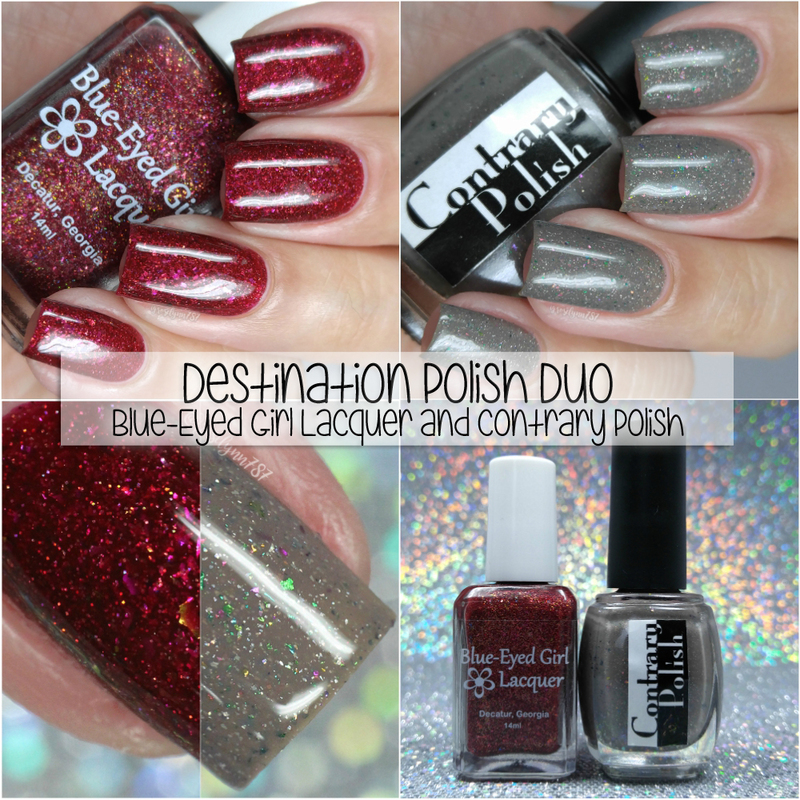 Today I'm sharing swatches for this month’s Destination Polish Duo by Blue-Eyed Girl Lacquer and Contrary Polish. The gorgeous shades are inspired by this photo that Carrie took at the Sundance Film Festival. Let's get to the swatches! 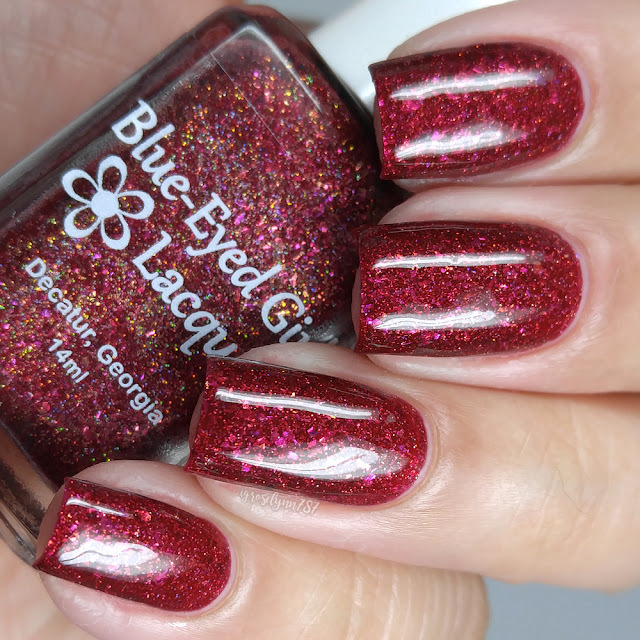 The Destination Polish Duo by Blue-Eyed Girl Lacquer and Contrary Polish will be available for pre-order from January 31st until February 7th. You can find the duo through either shop and both will ship internationally. Each duo retails for $20 shipped domestically or $20 with a prorated shipping fee internationally. Special Selection can be described as a black cherry jelly with gold micro-flakies, gold ultra holo micro-glitters. It was so hard to capture the gorgeous flakies and glitters without my camera freaking out, haha. This shade has such a nice holo sparkle, definitely comes to life under direct sunlight. The formula has a really opaque application for a jelly polish. But the consistency is a bit on the thick side due to all the flakies and glitter. It is manageable though and there is no need to dab any layers. It dries textured and will need a thick layer of topcoat for a smooth finish. Shown in two coats and sealed with a glossy topcoat. Meet Me Under the Marquee can be described as a taupe crelly filled with holo flakes and multiple kinds of multichrome flakes (heavy on the green, gold, and red-violet). I'm absolutely living for the green foil like flakes! This is just such a unique and gorgeous shade! The formula has a sheer application, but builds up really well. Each brush stroke has a fantastic flakie pay off! It's very packed while not clumping together. It dries to a very high shine on it's own and a minimal gritty finish. Shown in three coats and sealed with a glossy topcoat. To recap, the Destination Polish Duo by Blue-Eyed Girl Lacquer and Contrary Polish will be available for pre-order from January 31st until February 7th. You can find the duo through either shop and both will ship internationally. Each duo retails for $20 shipped domestically or $20 with a prorated shipping fee internationally. 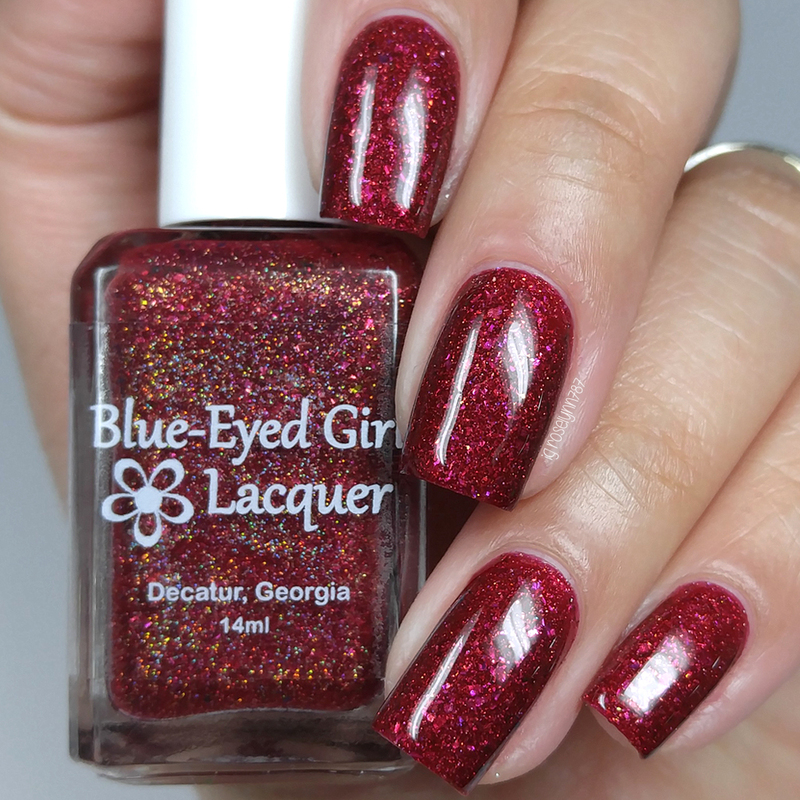 Seriously, your swatches are just stunning <3 <3 You caught that gold glitter so well, and I love your macros! Thank you so much for reviewing these for us!